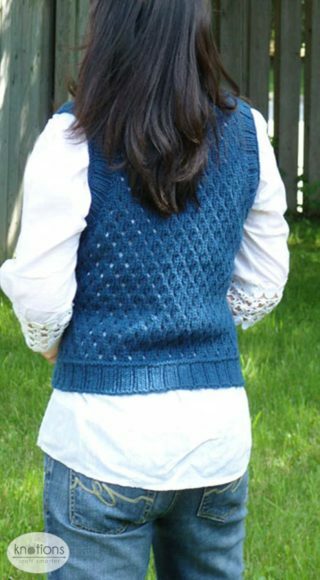 I was inspired to design this vest by the criss cross pattern of my neighbor’s fence. We all know how hard it is to put our arms into those tight winter jackets when we wear bulky winter sweaters. Wear this vest layered over a shirt; your arms will be free and the vest will shield your back from those cold winter winds just like a protective fence. 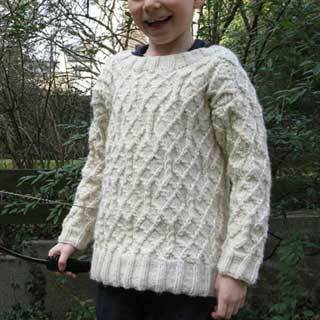 And if you need more incentive, this is a relatively quick knit with just two main pieces. 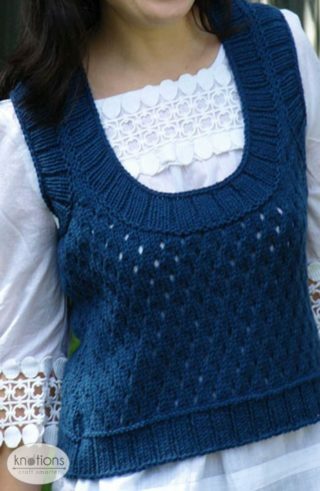 I hope you enjoy knitting this vest as much as I loved sharing it with you. 16 sts and 20 rows = 4”, or 8 sts and 10 rows = 2” in staggered eyelet pattern after wet blocking. Stitch markers; stitch holders; tapestry needle. LKI (Left-leaning lifted incresase): Insert left needle into left loop of stitch two low below last completed stitch. Knit this stitch through the back loop. You can substitute this for m1L. RKI (Right-leaning lifted increase): Insert right needle into right loop of stitch just below next stitch. Place it onto left needle and knit. Then Knit the stitch on needle. You can substitute this for m1R. 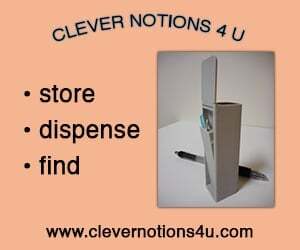 Please see detailed step-by-step instructions on the lifted increase here. The body pieces have very narrow shoulders; wide neck and arm bands are added to the body during finishing to create the shoulder width. 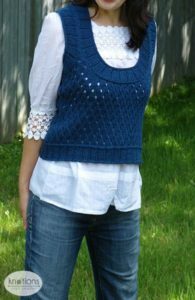 The pattern includes options for two different lengths and instructions for how to re-size the pattern if you’re in between sizes, so, read the pattern carefully and let’s knit. Note: Side shaping is identical on front and back. How to get correct gauge? 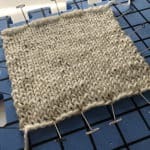 Count sts and rows within a 2” or 4” square after wet blocking. This CO stitch is worked with a crochet hook 0.5 mm smaller than the main needle size. I selected this CO because it matches the look of the bindoff. Make a slip knot. Hold crochet hook in your right hand and hold knitting needle in your left hand. 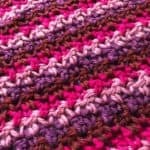 Bring the yarn under the needle and grab a loop over the top of the needle using crochet hook. Bring the yarn back under the needle in preparation for the next stitch. Repeat for desired number of stitches minus one. Move the loop from the crochet hook on right hand to the needle for the last stitch. Crochet CO 62 (70, 78, 86, 94, 102, 110, 118) sts with US 8 (5mm) needle and US G (4.5mm) crochet hook. Row 1 (WS): K2, *p3, k1, rep from * to end. Repeat Rows 1 and 2 until piece measures 2” from CO, ending with a RS row. Next Row (WS): K15 (17, 19, 21, 23, 25, 27, 29), m1R, *k16 (18, 20, 22, 24, 26, 28, 30), m1R* twice, k15 (17, 19, 21, 23, 25, 27, 29) – 65 (73, 81, 89, 97, 105, 113, 121) sts. Row 7: K1 (selvage st), *k2tog, yo, k2, rep from * to end of row (note – selvage st is worked as a part of the last rep – no need to work a separate selvage st). Cont even in patt until piece measures 3 (3, 3, 3, 3½, 3½, 4, 4)” from CO edge, ending with a WS row. Dec Row (RS): K1, k2tog, work to last 3 sts, ssk, k1 – 2 sts dec’d. Cont even in patt until piece measures 8 (8, 8, 8, 8½, 8½, 9, 9)” from CO edge, ending with a WS row. Keeping continuity of patt, rep Inc Row every 6th row an additional 3 times; 61 (69, 77, 85, 93, 101, 109, 117) sts. You will now folow separate instructions for the front and the back. Cont even in patt until piece measures 13 (13, 13, 13, 13½, 13½, 14, 14)” from CO edge, ending with a WS row. Keeping continuity of patt, rep Dec Row every 6th Row an additional 5 times; 53 (61, 69, 77, 85, 93, 101, 109) sts rem. Cont even in patt until piece measures 15 (15, 15, 15, 15½, 15½, 16, 16)” from CO edge, ending with a WS row. BO 7 (9, 11, 12, 13, 14, 15, 17) sts at beg of next 2 rows, and BO 3 (3, 3, 4, 4, 4, 5, 5) sts at beg of next 2 rows. Dec 1 st at each armhole edge next RS row once, 4th row once, and 6th row once – 35 (39, 43, 47, 53, 59, 63, 67) sts rem. Cont even in patt until piece measure 9 (9, 9½, 9½, 10, 10, 10½, 10½)” from armhole edge. Work even in patt until piece measure 7½ (7½, 8, 8, 8½, 8½, 9, 9)” from armhole edge. Work even in st st until piece measures 1½” from back neck edge. Place rem sts on stitch holder or safety pin. Work even in st st until piece measure 1½” from Back Neck edge. Place rem sts on stitch holder or safety pin. Short Version: 10 (10, 10, 10, 10½, 10½, 11, 11) ” from CO edge, ending with WS row. Long Version: 12 (12, 12, 12, 12½, 12½, 13, 13) ” from CO edge, ending with WS row. Split for Neck (RS): K23 (26, 28) sts, join new yarn, BO 15 (17, 21) sts, k to end of row. Row 2: BO 4 (4, 5) sts, work to end of row . Work evenly for 2 rows. Rows 5, 9, 15 (Dec Row): Ssk, work to end of row. Row 1: BO 4 (4, 5) sts, purl to end of row. Work evenly for 1 row. Rows 4, 8, 14 (Dec Row): Work until 2 sts rem, k2tog. Short Version: Cont even in patt, working both sides of neck separately, until piece measures 13 (13, 13)” from CO edge, ending with a WS row. Long Version: Cont even in patt, working both sides of neck separately, until piece measures 15 (15, 15)” from CO edge, ending with a WS row. Split for Neck (RS): K33 (36, 39) sts, join new yarn, BO 19 (21, 23) sts, k to end of row. 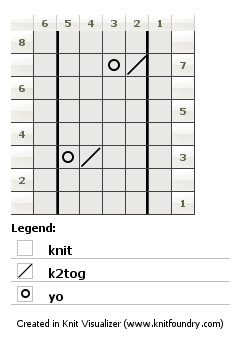 Row 2: BO 4 (5, 5) sts, k to end of row. 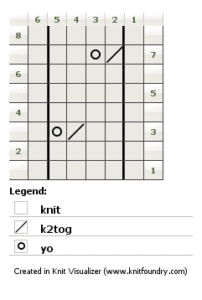 Row 4: BO 3 (3, 4) sts, k to end of row. Rows 6, 8, 12, 18: Ssk, k to end of row. Row 3: BO 4 (5, 5,) sts, purl to end of row. Row 5: BO 3 (3, 4) sts, purl to end of row. Short Version: Cont even in patt, working both sides of neck separately, until piece measures 13 (13½, 13½)” from CO edge, ending with a WS row. Long Version: Cont even in patt, working both sides of neck separately, until piece measures 15 (15½, 15½)” from CO edge, ending with a WS row. Split for Neck (RS): K41 (45) sts, join new yarn, BO 27 (27) sts, k to end of row. Row 2: BO 5 (6) sts, k to end of row..
Row 4: BO 3 (4) sts, k to end of row. Rows 6, 8, 12, 16, 22: Ssk, k to end of row. Row 3: BO 5 (6) sts, purl to end of row. Row 5: BO 3 (4) sts, purl to end of row. Short Version: Cont even in patt, working both sides of neck separately, until piece measures 14 (14)” from CO edge, ending with a WS row. Long Version: Cont even in patt, working both sides of neck separately, until piece measures 16 (16)” from CO edge, ending with a WS row. Dec 1 st at each armhole edge next RS row once, 4th row once, and 6th row once – 3 (4, 3, 3, 4, 5, 5, 5) sts rem. Cont even in st st until piece measure 9 (9, 9½, 9½, 10, 10, 10½, 10½)” from armhole edge. Using mattress stitch, sew sides seams. Using backstitch, sew shoulder seams. Neck Band Pick Up Row: With RS facing, Pick up 80 (84, 92, 96, 104, 108, 116, 120) sts on Front and 24 (28, 32, 36, 40, 44, 48) sts on Back using larger circular needle. Arm Band Pick Up Row: With RS facing, pick up 60 (64, 72, 76, 84, 88, 92, 100) sts on Armhole using larger circular needle. 3×1 Rib Pattern: *k3, p1, rep from * to end of rnd. Work evenly in 3×1 Rib Pattern until ribbing measures ¾ (¾, 1, 1, 1¼, 1¼, 1¼, 1¼)” from pick up edge. Change to smaller circular needle. 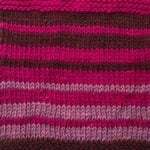 Work evenly in 3X1 Rib Pattern until ribbing measure 1½(1½, 1¾, 1¾, 2, 2, 2, 2)” from pick up edge. BO. Add 4 sts to the CO count for each of the back and front. CO 66 sts. When working the armholes, work an extra decrease on each side, and when working the neck, BO 2 additional sts when doing the Split for Neck row. Neck Band and Arm Band sts can remain the same as a size 30”. Is there any errata for this pattern? no there isn’t. if there was it would be right on the pattern page in red, and it would also have the date of the errata too.